Pigment dispersion syndrome (PDS) and pigmentary glaucoma (PG) are characterized by loss of pigment from the posterior surface of the iris and excessive pigment release throughout the anterior segment of the eye. The essential diagnostic signs include a unique pattern of mid-peripheral iris transillumination defects and pigment deposits on the corneal endothelium, the trabecular meshwork (TM), the iris, and the lens. Individuals with PDS may have normal or elevated intraocular pressure (IOP) without glaucomatous optic nerve damage. Patients with these same findings who demonstrate optic nerve damage and/or visual field defect are classified as having pigmentary glaucoma. PDS and pigmentary glaucoma are more prevalent in males and typically present in the third or fourth decade of life. Contact of the posterior iris against the lens is thought to produce excessive pigment release into the anterior segment. Pigment accumulation in the trabecular meshwork impairs aqueous outflow, elevating IOP, and may subsequently cause chronic outflow dysfunction, optic nerve damage, and visual loss. Treatment options are similar to those for primary open-angle glaucoma and include medical therapy, laser iridotomy, laser trabeculoplasty, and invasive surgical interventions. Pigment dispersion is a fascinating cause of secondary open-angle glaucoma, recognized by its distinctive ophthalmic examination findings. Originally considered a rare condition, PDS was introduced around 1900 when Krukenberg described the characteristic corneal pigment. Over time, the condition became defined by the clinical triad of this signature pigment deposition on the corneal endothelium (Krukenberg spindle), radial mid-peripheral transillumination defects of the iris, and hyperpigmentation of the trabecular meshwork. Although PDS and pigmentary glaucoma are now routinely recognized, much remains unproven about the exact causative pathophysiologic mechanism, whether damage to the trabecular meshwork can be prevented, and how to best minimize optic nerve injury. Although PDS and pigmentary glaucoma are now widely recognized, the exact cause is still debated. 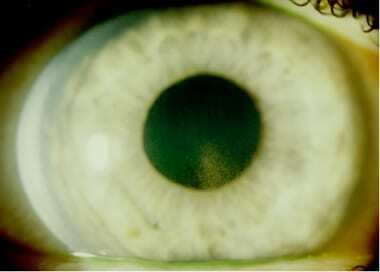 The release of pigment granules from the iris pigment epithelium is the underlying hallmark in these disorders. There is often a posteriorly concave contour of the iris and a posterior insertion of the iris root into the ciliary body. [1, 2] Many believe that this exacerbates physical contact of the posterior iris surface against the anterior lens zonules and results in excessive pigment release into the aqueous fluid. In 1979, David G. Campbell, MD, proposed that pigment is released from the pigment epithelium of the iris when it rubs against the lens and the anterior lens zonules during normal pupil movements. This contact, Campbell argued, is brought about by a posterior bowing of the iris that is not present in most eyes. Others suspect that it is not the to-and-fro rubbing, but simply the appositional contact between the iris and the lens, that causes disruption in the iris pigment epithelial cell membranes and release of pigment granules into the aqueous fluid. Regardless of the exact mechanism of iris pigment loss, a unique pattern of iris transillumination defects manifests over time. Reverse pupillary block has been termed to explain the concave iris configuration in eyes with PDS and pigmentary glaucoma. During an eye blink, a small aliquot of aqueous is burped from the posterior chamber to the anterior chamber, resulting in increased pressure in the anterior chamber. This pressure gradient produces posterior bowing of the iris and increases iridolenticular contact. The increased area of iris-lens contact creates a flap-valve effect, maintaining the pressure differential and the posteriorly concave iris configuration. This process is similar to the change in iris and angle configuration that occurs during indentation gonioscopy. Similar iris concavity has also been observed with accommodation and in myopia. This concept of reverse pupillary block is supported by studies showing laser iridotomy reverses concave configuration. 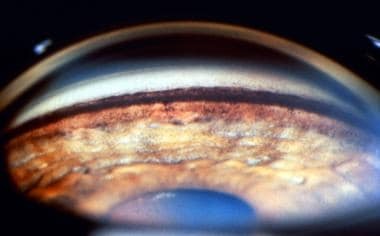 Despite this, laser iridotomy has not been demonstrated to stop the progression of pigmentary glaucoma. This leads some researchers to suggest an alternative, inherent factor that causes or contributes to iris pigment loss not directly caused by physical contact. Liberated iris pigment granules are carried by aqueous fluid and deposited throughout the anterior segment of the eye. 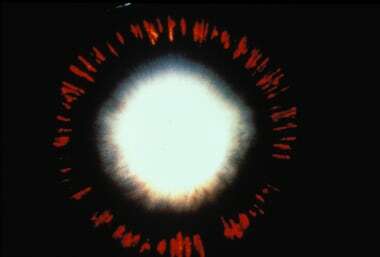 On the corneal endothelium, the pigment typically settles in a characteristic shape consistent with aqueous convection currents (Krukenberg spindle). The spindle tends to be slightly decentered inferiorly and wider at its base than its apex. It generally appears as a central, vertical, brown band up to 6 mm long and 3 mm wide. With time, Krukenberg spindle becomes smaller and lighter and often requires careful examination for identification. Pigment deposits are also observed on the anterior surface of the iris, the trabecular meshwork, the lens, and other anterior segment structures. Pigment accumulation on the trabecular meshwork impedes aqueous outflow and can trigger acute temporary elevations in IOP. This explains the acute blurred vision associated with strenuous exercise or pupillary dilation. Over time, some pigments undergo phagocytosis by the trabecular meshwork endothelial cells. In certain eyes, this endocytosed pigment does not cause trabecular dysfunction. In others, the trabecular meshwork becomes disorganized, causing obstruction of aqueous outflow, IOP elevation, and/or resultant secondary glaucoma. It is unclear why some patients with PDS develop long-term resistance to aqueous outflow while others tolerate the accumulation of pigments with no pathologic changes of the trabecular meshwork. Active pigment liberation typically occurs in patients in their third and fourth decades in life. Greater pigment liberation tends to occur in eyes with more pronounced iris concavity, presumably because of more contact or friction between the iris pigment epithelium and the zonules. As affected individuals age, relative pupillary block counteracts the posterior bowing of the iris and reduces its contact with lens zonules. This may lead to a decrease or resolution of active pigment release. Long-term regression of pigment deposits is sometimes seen. Lichter and Shaffer observed a definite decrease in the amount of trabecular meshwork pigment in 10% of 102 patients and concluded that the pigment could pass out of the meshwork as the patient aged. Krukenberg spindle and trabecular meshwork hyperpigmentation have been observed to resolve with time in some patients. Therefore, older patients presenting with glaucoma may have only very subtle manifestations, if any, of PDS, and may be diagnosed with primary open-angle glaucoma or low-tension glaucoma. Interestingly, despite the resolution of pigment deposits in the trabecular meshwork, impairment in aqueous outflow and resultant glaucoma continues to progress. It is also not fully understood why laser iridotomy has not been shown to slow progression of pigmentary glaucoma although it is successful at reversing iris concavity. Pigmentary glaucoma may represent a subset of patients with pigment dispersion who have additional inherent predisposition to develop chronic ocular hypertension or glaucomatous optic neuropathy that is not altered by the removal of the concave iris configuration. Individuals with PDS, by definition, do not have glaucomatous optic nerve damage. However, they may experience acute IOP elevations with associated temporary blurred vision or develop chronic ocular hypertension. Patients with pigmentary glaucoma can suffer progressive visual field defect and significant vision loss. Male patients with PDS and pigmentary glaucoma are usually diagnosed in their fourth decade of life, whereas female patients typically presents in their fifth decade of life. PDS has been reported in individuals as young as 12 years. The condition becomes more prevalent in early middle age, likely because the lens has enlarged to be in greater contact with the concave iris. PDS and pigmentary glaucoma are commonly associated with moderate myopia (-3 to -4 D); however, a broad range of refractive errors has been reported. Prognosis is favorable with control of intraocular pressure (IOP). Blindness due to pigmentary glaucoma is rare. In a study of 113 patients with PDS and pigmentary glaucoma, 3 eyes in 2 patients were blind. Progression of the disease, however, is common. Ten percent of patients with PDS progressed to pigmentary glaucoma at 5 years and 15% developed pigmentary glaucoma by 10 years. Forty percent of patients with pigmentary glaucoma had worsening of optic nerve damage over a mean follow-up period of 6 years. Elevated IOP was the only identified risk factor for progression. This underscores the importance of monitoring and managing IOP in patients with PDS and pigmentary glaucoma. An interesting observation is that patients eventually diagnosed with pigmentary glaucoma almost always have clinical evidence of optic nerve damage, elevated IOP, or at least some abnormality in aqueous outflow on initial presentation. Conversely, PDS with normal IOP and normal aqueous outflow has a very low probability of progressing to pigmentary glaucoma. Individuals with PDS (no glaucomatous optic nerve damage by definition) and elevated IOP or abnormal aqueous outflow coefficient show a borderline risk of developing pigmentary glaucoma. It is therefore crucial to risk stratify patients with PDS based on the presence of elevated IOP or abnormal aqueous outflow, as this group has a real probability of vision-threatening disease. Uncommonly, pigment dispersion may also improve or regress with time. In some cases, corneal endothelial pigments, trabecular meshwork pigmentation, and even iris transillumination defects have been observed to resolve over time. Normalization of IOP has also been seen. Despite this, patients with glaucoma generally continue to progress. Early recognition of individuals with this ocular condition and careful monitoring of IOP and optic nerve damage are crucial for ensuring the best visual outcome. Good patient education helps to ensure compliance with the treatment of this chronic disorder.